Draconid Meteor Shower 2018 Peaks Monday! Here's What to Expect. 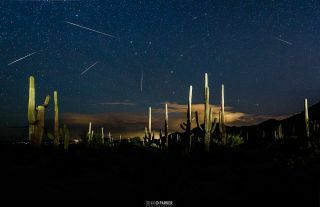 Astrophotographer Sean Parker captured this composite view of the amazing Draconid meteor shower of 2015 during his night sky workshop in Tucson, Arizona. The 2018 Draconid meteor shower peaks overnight on Oct. 8 and 9. If you're a meteor shower fan, mark Monday evening (Oct. 8) on your calendar, particularly if you live in the mid-Atlantic or northeast United States, as well as the Maritime provinces of eastern Canada. On that night, the Earth will pass through the irregular and surprised-filled Draconid meteor stream. The annual Draconid meteor shower occurs every year around Oct. 8 when the Earth passes through a stream of dust from the periodic comet 21P/Giacobini-Zinner, which from here on we’ll refer to as Comet G-Z. so named because the meteors appear to emanate from the constellation of Draco, the Dragon. The best known meteor display in October is the Orionid meter shower, which peaks around Oct. 21 and is one of the most reliable of the annual displays. This year, however, the Draconid shower is the wild card. Typically, little or nothing in terms of Draconid meteors is seen most years, but the Draconids have a Jekyll-and-Hyde personality. Notable meteor activity seems to occur when the Earth passes just inside Comet G-Z's orbit shortly after the comet itself has gone by. In 1933 and 1946 skywatchers were dazzled with astounding meteor “storms” that produced thousands of meteors per hour. In those years Earth crossed through particularly dense filaments of dusty debris that the comet had shed on previous fly-bys around the sun. The Draconids haven’t put on that kind of performance since, though rates reached into the hundreds per hour in 1985, 1998 and most recently in 2011. The annual Draconids Meteor Shower will peak overnight on the night of Monday, October 8. This shower, generated by debris dropped by Comet 21P/Giacobini-Zinner, usually delivers relatively few meteors. But it has occasionally been much more prolific. The best time to watch for Draconids will be after dusk, when the radiant in Draco is high in the northern sky. Unlike most meteor showers, the Draconids are at their best in the evening rather than after midnight. Their radiant (apparent point of origin die to perspective) in the constellation Draco is high in the northwestern sky when darkness falls; it moves lower throughout the night and is near the horizon by dawn. Begin watching the sky overhead as soon as it gets dark. No special equipment is needed — just an open view of the sky, a reclining lawn chair or blanket on the ground, a watch, and a note pad or tape recorder to keep count of any Draconids seen. The shower's radiant is close to the lozenge-shaped head of Draco, the Dragon. A shower member is a meteor whose path, if traced backward far enough, would appear to come from this spot. The meteors themselves can appear anywhere in the sky. Eastern New England and the Maritime Provinces of Canada are the places to be for watching whether the Draconids provide any significant meteor activity just after local sunset on Monday evening. Based on a consensus of reputable meteor experts, the shower's peak is predicted for about 23:50 Universal Time (7:50 p.m. Eastern Daylight Time). This map shows the areas that will be in night, astronomical twilight ("Late twilight"), and brighter twilight at that time. However, the time prediction could be off by as much as 20 minutes or so, and some of the meteors may be bright enough to show through a lot of twilight. Observers somewhat west of the prime area could have a chance to spot meteors. Draconid meteors appear to come at us from the north, almost perpendicularly to the plane of the solar system; the north pole of the ecliptic (in effect, the north pole of the solar system) lies in Draco. The meteors appear to move slowly, their entry speed of 12 miles per second (20 km/s), being among the slowest of any meteor shower. Notes British meteor astronomer Alastair McBeath: "Poets among us might like to think of these as the 'Dragon's Tears' or as its fiery breath." This plot shows where meteoroids have been thickest around 21P/Comet Giacobini-Zinner, as revealed by Earth getting a shower when it plunged through the comet's orbital plane. The horizontal scale tells the number of days by which meteoroids lag behind the parent comet (+) or run ahead of it (-). The vertical axis is the distance in astronomical units that the particles are outside the comet's orbit (-) or inside it (+). One astronomical unit is equal to 92.9 million miles (149.5 million km). Our pass through the orbital plane in 2018 lies midway between the 1946 meteor storm and the 1985 outburst. In October of 1998, I wrote a feature article for Sky & Telescope magazine about the Draconid meteor shower and using data kindly provided by Donald K. Yeomans, of NASA's Jet Propulsion Laboratory at the time, created a diagram which depicted where meteoroids had apparently been thickest around Comet G-Z. The distance between the two orbits at the nodal crossing point is plotted vertically, and the time when Earth crosses this point ahead of, or behind the comet is plotted horizontally. Eighteen past encounters are plotted. The major showers of 1933, 1946, 1985 and 1998 are shown as starbursts, lesser showers as dots, and years of low or zero reported activity as open circles. Looking 20 years into the future, I placed a question mark for where Earth would be in 2018 relative to the node of the comet, since the orbital geometry between the two seemed roughly midway between the meteor storm of 1946 (3,000-6,000 per hour) and the strong meteor outburst of 1985 (600-800 per hour) At the time I had a good feeling that 2018 would bring another memorable Draconid shower. But that sanguine outlook would soon change. Each Draconid meteoroid follows its own slightly different orbit. Jérémie Vaubaillion modeled the orbits of swarms shed by 21P/Comet Giacobini-Zinner during each of its passes by the sun in 1946, 1953 and 1959. Earth's progress is marked 0:00 UT from October 7 to October 13 (European style of Day/Month is used . . . so "8/10 = October 8). Earth is forecast to pass through a "gap" or hole in the thickly clustered channel of dusty comet debris just before 0:00 UT on October 9, presumably avoiding a potential storm of meteoroids. The GAIA spacecraft, however, is apparently directly in the path of the meteoroid cloud to the right of the Earth's path. But today, astronomers using computer simulations routinely calculate the locations in space of individual dust trails and have been able to successfully predict the intensity and arrival of the peak of a variety of meteor showers to within an hour, sometimes even to within minutes. Unfortunately, when meteor experts used their state-of-the-art computer simulations to look ahead to the 2018 Draconids, there was bad news. What they found was a large "gap" that had seemingly been opened within a channel of a closely bunched group of meteor trails from 1946 through 1959. The Earth is forecast to move through that gap on Monday evening and, for the most part, miss out (by several hundred thousand miles) on a thick cloud of dusty material that might otherwise produce a stupendous storm of meteors. Interestingly, the European Space Agency's Gaia spacecraft that launched in December of 2013 to make precise measurements on the positions and distances of stars is located approximately 930,000 miles (1.5 million km) from Earth, and is right smack in the predicted path of the dense cloud of comet debris. Canadian astronomer Peter Brown told Space.com: "ESA will reorient their spacecraft to minimize the chance of Draconid impacts, though we hope they see something —they are one of the most sensitive platforms ever put in orbit for detecting small meteoroid impacts by nature of their mission." Despite Earth likely missing out on a full-blown meteor storm, several forecasts from reputable meteor pundits worldwide suggest that there still could be some modest, albeit short-lived (1- or-2-hour) Draconid activity spike appearing soon after dark for parts of eastern North America on Monday evening. Brown, who with his wife Margaret Campbell-Brown edits the meteor section of the annual publication "Observer's Handbook" of the Royal Astronomical Society of Canada (RASC, 2017), predicts a peak at 7:51 p.m. EDT (2351 GMT) with meteor activity not exceeding a few tens of meteors per hour. Astronomer Mikiya Sato of Japan has found an approach of the Earth to the comet's 1953 dust trail. This trail was slightly disturbed when it approached the Earth in 1985. Consequently, the dust should be spread somewhat, but could still produce recognizable rates in the range of 20–50 meteors per centered on 8:14 p.m. EDT (0014 Oct. 9 GMT). Astronomer Jeremie Vaubaillon of France noted a possible maximum at 7:31 p.m. EDT (2331 GMT) with an hourly rate of about 15 meteors. A forecast model by Russia's Mikhail Maslov found several dust trails, but none of them close enough to cause high rates in 2018. The closest was the 1953 trail which has been rarified due to previous Earth encounters. Even so, he suggests 10–15 meteors per may occur at 7:34 p.m. EDT (2334 GMT). Will the Dragon flame in 2018? I think it should be stressed that with the Draconids there is always a chance of a surprise. There are uncertainties in the precise locations of dust trails shed by Comet G-Z that are large enough to sometimes confound attempts to model the shower accurately. Because the Draconid meteoroid stream's orbit extends toward Jupiter, that planet's gravity may have jostled the stream about, hindering accurate predictions for future showers. In October of 2012 for instance, observers in Eastern Europe were surprised by a brief outburst of dozens of bright meteors, while Canadian radar picked up on thousands of radar echoes caused by interaction of Earth with a trail of dust shed by Comet G-Z in 1966. The experts did not think anything noteworthy would happen, but they were wrong. So on Monday, without sacrificing any sleep, you'll have a chance to see if another surprise is in the offing. So what do you have to lose? It may rise above your expectations … or you may be disappointed. Admittedly, it doesn't look very good, however, anything can happen. That's just the nature of the October Draconids; you never quite know. Editor's note: If you capture an amazing photo of video of the Draconid meteor shower of 2018 and would like to share it with Space.com for a story or slideshow, send comments and images in to spacephotos@spcae.com! Joe Rao serves as an instructor and guest lecturer at New York's Hayden Planetarium. He writes about astronomy for Natural History magazine, the Farmers’ Almanac and other publications, and he is also an on-camera meteorologist for Verizon FiOS1 News in New York’s Lower Hudson Valley. Follow us @Spacedotcom, Facebook or Google+. Originally published on Space.com.